Bank of Iwate Red Brick Bldg. 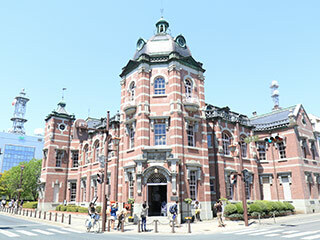 (岩手銀行赤レンガ館) is one of the old brick buildings that designed by the same architecture, Kingo Tatsuno, who built Tokyo Station. It is located in Morioka, Iwate Prefecture. It was constructed in 1911. It designated as the national important cultural assets. It is the gorgeous western style building. Admission: 300 yen for adult and 100 yen for kids. There is a free zone that visitors can enter without the admission fee. Map around Bank of Iwate Red Brick Bldg. Bank of Iwate Red Brick Building was constructed in 1911 by Kingo Tatsuno and his students in 1911 for Morioka Bank. Kingo Tatsuno is a famous western style architecture who also designed Tokyo Station. This building is the only building that Tatsuno designed in Tohoku Region. It is three stories building and there is a huge wellhole space that is absolutely beautiful. The charged zone have completely restored the old bank and displays many historical records of this bank.